This article was written by Katy Wilson, published on 15th July 2013 and has been read 4763 times. Katy is studying French, Spanish and Portuguese at University of Birmingham and spent the second semester of her third year abroad as an Erasmus student at the Universidad de Málaga. Málaga is a relatively big city and so first looking at the map and trying to decide where to live was very daunting. Most Erasmus students head for the historic centre as it’s where the majority of bars, restaurants, shopping and nightlife are. It’s also very pretty, a fifteen minute walk from the beach and a twenty minute bus ride to the university. My best advice would be to live in the areas around Plaza de la Constitución and Plaza de la Merced – this sounds very exact but pretty much anywhere in the old city is a great place to be and most of the student accommodation available is around this area anyway. The only thing to be aware of is that this area of Málaga can be quite noisy! If you want to avoid nightlife noise (people smoking outside bars etc) then stay away from the Calle Comedías area as this is where most clubs are– in the summer heat you will want your window open! I grew used to the noise of the clubs under my flat in this area but if you’re a light sleeper, this may be something to avoid. Student halls are available through the university; these are out on the Campus Teatinos. It’s right by the university (if you’re on the Teatinos campus – most people are!) but the buses to the centre don’t run after 10pm and a taxi is about €20. I know people who loved the halls they were in but is also worth baring in mind they’re much more expensive than the average rent in Málaga which is probably only about €300/350 a month. I found my flat through a company the University International office recommended, so it’s definitely worth asking! In terms of choosing a location with hundreds of low cost flights daily from all over Europe, you can’t do much better than Málaga. Ryanair and Easyjet both fly to Málaga but it’s also worth checking out Spanish airlines such as Monarch and Vueling who also fly daily to the UK. Once you’re at the airport there’s a great new train service that goes from directly outside departures into ‘Málaga Centro’ for €1.70 (2013) and takes just ten minutes, they run from about 5.30a.m until about midnight. A taxi costs €20-30. For travel inside the city, once you have a student card you can buy a discounted bus pass (monthly or annually) – this pass gets you unlimited travel on the bus services and costs €28 a month (2013) – this can work out really well if you’re living in the city and commuting to university every day on the bus. However if you’re living in the city centre pretty much everything is walking distance (train station, supermarket etc.) so you don’t need to worry about transport too often! The first thing to know about Málaga and Andalucía is that the locals have a very strong regional accent. They don’t say ‘s’ on the ends of words (gracias becomes ‘gracia’), sometimes they don’t say them in the middle of words and sometimes it feels like they swallow half their words… you will adjust and afterwards any Spanish from any other part of the country sounds incredibly clear. It’s probably the best region for your listening practice because if you can understand Andalucíans at full speed, you can understand anything! The second thing to know is you will never want to leave! I don’t think I met one person, student or visitor, who didn’t fall in love with Málaga and I’m not surprised! 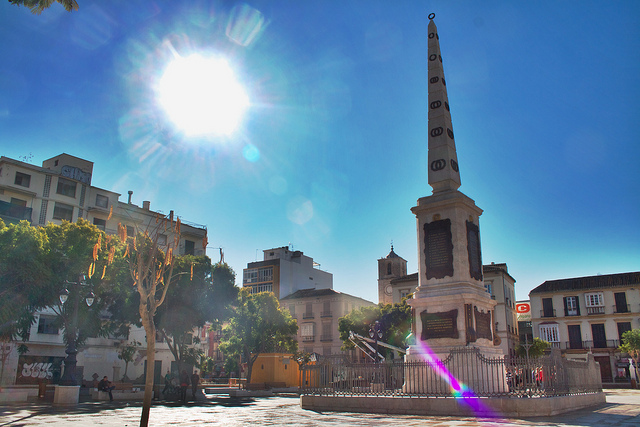 The people are very welcoming and friendly, it is a beautiful, well kept city with plenty to see and, of course, it is on the famous Costa del Sol! In the city itself, there’s the Picasso museum and you can also visit the house he was born in. The Cathedral and the Alcazaba are Málaga’s little bit of history and a walk up to the Gibralfaro will give you stunning views out over the city. ‘Muelle Uno’ has recently been redone and is full of little shops, bars and restaurants with fantastic views of the harbour. Easy days out from Málaga include all of the famous beach resorts such as Torremolinos, Fuengirola and Marbella! A night out in Puerto Banus or a day trip to Granada, whether you’re a party animal, a cultural sight-seer or a bit of both – the region has something to offer you. My two personal favourites were Gibraltar (perfect for when feeling homesick) which is accessible from Málaga by bus and the coastal town of Nerja, also accessible by bus. Nerja is a lot less touristy but the ‘Balcon de Europa’ and the surrounding cafés are a lovely way to spend the afternoon. It’s always worth looking at car hire from the airport here too as it is relatively cheap and works out well for long days in big groups! Calle Larios and Plaza de la Constitución are the main shopping area, it is a beautiful big marble* street in the historic centre with plenty of variety. There’s also lots of little tourist shops and café for a nice afternoon out in the sunshine. Our favourite bar was ‘Cheers’ near the cathedral - it served popcorn, peanuts and sweets with any drinks ordered! It’s also worth heading up the to the rooftop bar on the AC Palacio Hotel as it has a beautiful view over the city – head up at sunset for the best view! Most Erasmus headed to Picasso Bar and Robert Boyd’s Tavern on Plaza de la Merced as they offered special deals for students. Malafama was by far the best club for a Thursday night (good mixture of music) and was a special Erasmus night with cheap drinks. Make friends with the different groups on Facebook such as Erasmusic and Study Cool as they post plenty of events and will keep you up to date with where everyone’s heading! ‘Taberna del Siglo’ on Plaza del Siglo serves great, traditional tapas at reasonable prices and the staff were always really friendly! For a slightly different type of tapas try La Plaza on Plaza de la Merced – the owner is English and so there is an interesting mix of English and Spanish foods. They are also very vegetarian friendly which is hard to come by in Spain…. Head to Los Alamos on the train, it is two stops further than the airport and takes about 15 minutes from the city centre. It’s a lot quieter than other beaches with much less tourists but just as nice! *It’s worth taking some waterproof non-slippery shoes for these marble streets when it rains… that’s right, it rains sometimes! 1. The Spanish take Sundays seriously. Sundays are a family day and EVERYTHING is closed, not England-Sunday closed… get into a good habit of buying enough food for the weekend on Fridays! This applies to siesta too, don’t decide to pop to the post office at 3pm – siesta is very much sleepy time, even in the city! 2. Easter in Spain or ‘Semana Santa’ is a big deal. Don’t expect to get any sleep this week! The Spanish are famous for their fiestas for a reason and they really prove it in Semana Santa. With parades all through the day and into the early hours (5am! ), the sound of brass bands and the smell of incense will fast become so normal you’ll forget they weren’t always there. It will be so tempting to go home during your Easter holidays but I would really recommend staying at least for a few days… I have never seen anything like I have that week! The arrival of the processions and thrones at the Cathedral was incredible, the atmosphere is indescribable and something you really have to see for yourself! The best way I found to cope with the admin and organisational side of the university was to laugh to myself and say ‘Oh, Spain.’ Otherwise you will go crazy! Don’t take it too seriously and certainly do not stress about it – the reply you will hear the most is ‘mañana’ and the sooner you come to live by this, the sooner you will learn to love Spanish (lack of) bureaucracy…! The people at the international office at UMA were always really helpful, when in doubt I would always go to them as they were very friendly. Before I left for Málaga I scoured the internet for people to tell me how to make the year abroad go quickly, how to get out of it or how to go home cheaply as frequently as possible. I was terrified! The best answer I could find anywhere was people saying ‘just enjoy it!’ which really started to frustrate me. I love being near to home, I still standby my argument that Bournemouth is one of the most beautiful places to live; why on earth would I want to leave? But now, I have to admit, I’ve been converted. The first week or so were scary, I can’t pretend that the element of unknown didn’t drive the Control Freak inside me crazy BUT I now agree with those irritating people that all those months ago had written ‘enjoy it’. From the bottom of my heart, the best thing I can suggest is to keep busy and annoyingly, ENJOY IT. The more you throw yourself into and the more you develop a routine the faster time will fly. With two months to go I was praying time would slow down (and trust me if you’d asked me at Christmas I would have not believed that of myself). You may be sat reading this thinking you can’t wait to go, or like me you may be full of dread and worry that you’re going to end up in a horrible place with horrible people. Erasmus is what you make of it, if you go out, meet people and say yes to the millions of Facebook events that spam your newsfeed you will have an AMAZING time. If you sit at home crossing days off your calendar I’d be inclined to say, you’re going to be crossing those days off very slowly. Make the most of every second, because after all… you’re only Erasmus once! What websites are useful for finding an internship in Spain/ South America?